Join the Society of Children’s Book Writers and Illustrators (SCBWI). This is probably the most important thing you can do to learn what you need to know. Join a critique group. The SCBWI can help you find one. Read, read, read. Seriously. When I was starting, I picked my five favorite picture book authors and read every single book they’d ever written. Then, I picked five more and did the same. And then, I just kept going. If you want a place to start, here's a list of my favorite picture books. The Purple Crayon | Boni Ashburn’s site | The “Kitchen Full of Slush” post from the Editorial Anonymous blog | A Bit of Publishing Advice from author Nancy Tupper Ling. Read THE COMPLETE IDIOT'S GUIDE TO PUBLISHING CHILDREN'S BOOKS. Even though you're not an idiot, this will help keep you from making beginners' mistakes. But don't submit your work too soon. This post from author extraordinaire Kate Messner explains why your first idea or your first manuscript likely isn't your best. I wrote a children’s book and sent it to a publisher. They want to publish it! I just need to pay some money up front to subsidize the costs/share the publisher’s risk/get a professional edit/hire an illustrator. Is that normal? There are two different routes to becoming a published author. There are pros and cons to each, but knowing the difference and deciding what you want is important if you're going to have a successful experience. The first route is traditional publishing. These publishers review the manuscripts they receive and decide which ones they want to publish. Most of these publishers receive thousands of submissions each year and only choose to publish a handful. When they do choose to publish a manuscript, they pay the author some money up front known as an advance. Then, the publisher chooses and hires and pays the illustrator, designs the cover, edits and proofreads the work (with input from the author), pays for the printing, handles the distribution and helps with the marketing. At no point does the author pay for any of these tasks. When the book is published and for sale, if it sells enough copies to turn a profit for the publisher, the author then receives royalties on all sales after that, which are a percentage of the book's purchase price. All this can be a big pro in terms of the author’s finances and the quality of the finished book. The cons are that it can be very difficult to get your work accepted by these publishers. Because of the financial risk they are taking on, they only choose manuscripts they feel very confident they can turn a profit on. And, because many people want their work published by these big-name presses, they get tons of submissions. And, some traditional publishers will only review manuscripts submitted by literary agents, so if a writer doesn't have an agent, he or she may not be considered. Most, but not all, of these traditional publishers are in the New York area. If you want your book to have national exposure and end up on bookstore shelves, traditional publishing is your best bet – although it isn't guaranteed. The second route is subsidized publishing (sometimes referred to as vanity publishing , indie publishing or self-publishing). These publishers accept a much higher percentage of the work that is submitted to them because they transfer much or all of the publication costs back to the author. The author pays or helps pay for the illustrations, the editing and the printing – either individually or as part of a flat fee – and they often are responsible for much of the marketing and distribution of the book. The pros here are that authors can get really involved in how they want their book to look as long as they have the funds to pay for it. And, this can be an ideal option for someone who's able to treat book-publishing as a business and can write, build a platform and market with equal degrees of success. It also can be a good option for people with a book that may not have a national market – like a family history book, a church cookbook or a book that the writer just wants to give to family and friends. The cons are that the author is making a financial investment that may or may not pay off, and many authors don't have the book design and/or promotional skills (or time) to really make the book a success by themselves. And, many bookstores and libraries do not purchase self-published titles. There are vanity and subsidy publishing national success stories, but they tend to be the exception rather than the rule. It can sometimes be hard to tell initially if you're dealing with a traditional press or a subsidy press. But if, as the author, you are told at any time that you need to pay a fee, it's not a traditional publisher. Jane Friedman recently released a helpful chart that breaks traditional publishing and subsidized publishing into six distinct categories and describes each category in detail. It's well worth checking out. 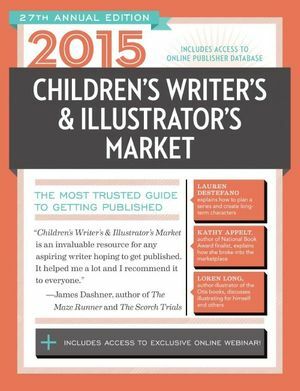 A great book that lists publishers and info about them is CHILDREN'S WRITERS AND ILLUSTRATORS MARKET. It lists reputable publishers, whether you need an agent to submit to them, the types of books they're looking for and describes specifically how to contact them. There's also a national organization called the Society of Children's Book Writers and Illustrators (SCBWI) that you can join for $80 a year. It provides tons of information about the publishing process, holds conferences where you can meet editors and agents and successful writers, offers writing grants, has message boards where you can post questions to other writers, helps members form critique groups and shares tips on becoming a better writer. If you’re serious about being a children’s author, joining is the best thing you can do for yourself.